Not gonna lie here, I loveeeeeee sophistipop. Be it Scritti or Tears for Fear or Prefab Sprout. Producer and multi-instrumentalist Adrian Knight seemingly has a license to print sophisti-pop gold and this new Galtta Media release by Nick Stevens is noooooo exception. Steven's hypnotizingly deep voice lends to the intricate songsmithing and unique arrangements but this is really pressing on something deeper and more realized than much of what I've heard in a while from pop music in general. 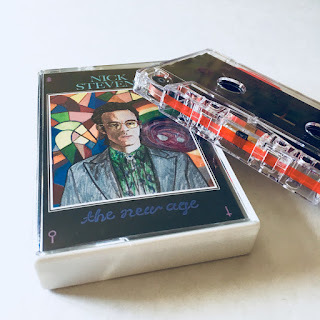 Reliablely steering clear of 80s pastiche, there is a unique smoothness, especially in David Lackner's saxophone solos and the crisp drum machine accented by hand percussion. Knight's keyboard playing is unbelievable and hard to define in its uniqueness and the chord changes are jazzy, sweeping, and unpredictable throughout. "Inviting You (Into My Life)" is a truly remarkable track. At almost seven minutes long, it borders on Steely Dan grooves, Paul McCartney melodies, Beach Boys harmonies, and Yellow Magic Orchestra timbres. There are lots of exciting harmonic jazz jumps in the chord progressions on this album. Every song has finally tuned keyboard and guitar hooks. "(Beyond)The Law" is a smoove grooving instrumental with almost a tinge of the Residents in Alice Cohen's airy background vocals. "Colors of the Sunset" could draw comparisons to "I'm Your Man"-era Leonard Cohen not only in the baritone vocal delivery but the deep hues of lyrical content. "All Night Messiah" is a serious take on pop with a convincingly deceptive melody and funky bassline. The title track is another standout with its strikingly complex counterpoint and icy synth parts. The final track, "Motorcycle" is almost suitably Abba-esque in its grace and mesmerizing pop-disco drum & bass groove. All and all, every Galtta Media release I've heard thus far strikes me as fantastic (especially Knight's solo album "On The Prowl Again" and Blue Jazz TV featuring Billy G. Robinson's two releases on the label). If you like pop, old or new, this is for you! !